Choosing your wood in a golf game can be the determining factor in how well you do on the green. This golf club is a big deal to serious and amateur golfer alike, and choosing a new one can be a difficult task. Woods are used for lifting and projecting the golf ball toward your desired target. Before you start your search for the perfect Fairway Wood, you should be asking yourself what you need your wood to do for you. Are you a golfer looking for more height? Do you need a club to use off the tee, to replace your 3 iron or to hit from the rough? Depending on your answer to these questions will determine which wood is going to be the best for your needs on the green. No matter for what reason you need a new wood for, this guide is here to simplify the search process and make it easy for you to find your perfect club. When it comes to golf, it is easy to become lost in a sea of options, with no way to distinguish quality products from their low-quality counterparts. Below are five of the best woods on the market for improving your accuracy and golf swing, as well as some things to look for when searching for wood. Now golfers can adjust the loft of their wood with a simply adjustable hosel. Keep in mind that not all woods come with adjustable lofts, so you should do your research if this is something you are interested in. Removing a single screw in the wood’s heel and connecting the shaft to the club head by replacing it with a predetermined setting achieve these adjustable lofts. The face angle of wood is the angle of the club when it hits the golf ball. There are both open-faced clubs and closed faced clubs. The important difference between these two is that an open-faced club will decrease your loft while a closed faced club will effectively do the opposite and increase your loft. Moveable weights are usually features seen in drivers that can help to increase the flight of the golf ball. Today, more and more manufacturers are starting to include moveable weights into their wood designs. These are weight screws and allow you to determine exactly where you want the weight to be located on the club head and how much. Titanium used to be the main player when it came to wood constructions. It was quickly replaced with the more cost efficient and malleable steel but is still seen a fair amount in woods today. When looking for the best wood for your golf game, shafts are an essential factor to consider. While shafts are an important part of every golf club, they especially play a significant role in the wood. Longer shafts can give the player more distance and a greater speed at the club head. While shorter shafts offer more control much like an iron. 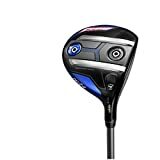 This Callaway Big Bertha is a great wood for golfers who are looking for some forgiveness and a little help giving their golf ball some height. The crown of this wood is constructed out of lightweight and high performing carbon composite, giving your golf swing an extra punch. The weight that is not in the crown can be found in the pack and outskirts of the wood allowing gravity to launch the ball into the air. The graphite shaft is optimized for greater control and superior accuracy. With this wood, you will be able to hit your golf ball wherever you need it to go. Made by the same manufacturer as the Big Bertha, this Callaway Epic/Sub Zero wood features Callaway’s signature face wrapping around the entire perimeter of the crown and sole. Thanks to the use of the extremely lightweight and durable triaxial carbon composite material in the crown, there is a lower center of gravity in the club. This low center of gravity allows your golf ball to soar to new heights. The Cobra King definitely wins the award for best design in our book. This Cobra King LTD Black wood is constructed with a carbon crown and graphite shaft. Its design is sleek and cool, with an all black crown and shaft. Much like the Cobra King LTD, the F7 version boasts a sleek design with slightly more weight. This is a classic Cobra wood that gets the job done. It is best for those not looking for thrills and frills, as this wood is incredibly forgiving and promises a good game. The loft adjustability is incredibly easy, so easy that a beginner could do it. It also boasts an excellent dual rail system that gives your golf swings a smooth and easy delivery into the turf. This wood provides the best in stability and reliability, making it a great option for beginners and pros alike. The Ping Fairway Wood is known for its unique design of placing the edge closer to the turf so that golfers can avoid the problem of catching the golf ball too low on the face. With this wood, you will be able to hit the golf ball higher on the face and give it better launch and incredible speed. If you are looking for a high performance, quality and durable wood, the stainless steel Ping Fairway may be just the wood to help you improve your next game. Woods are an essential club in any golf game, and have a good one can definitely give you an advantage over your opponent and increase your odds on the green. When searching for the perfect wood for you, you should always keep in mind factors like adjustability, materials, and the length shaft. 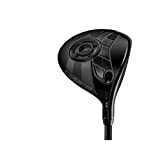 After rounding up the five best woods we could find, our overall winner is the Cobra King LTD Black for its sleek and modern design, aerodynamic construction and excellent performance on the fairway. No matter what kind of wood you are looking for, with this guide you will be able to find the perfect one to help you improve your golfing game.